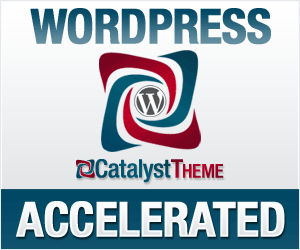 Catalyst Theme for WordPress is my favorite theme for developing SEO friendly WordPress sites quickly and effectively. It’s a very design friendly theme which allows a H-U-G-E degree of flexibility that means you can do almost anything with it to get a site looking just how you like. In addition, almost anything you want to change can be done without coding. If you’ve been put off some themes by the need to tweak and hack around at CSS coding to make even apparently minor changes, then you’ll be pleasantly surprised by Catalyst Theme. It even provides a ‘click and build’ custom CSS builder for those times that your requirements aren’t met by the standard interface. This means you still don’t have to know how to code… the Catalyst Custom CSS builder does it for you! Click, Build, Drag and Done!! Very simple, very fast. Using Catalyst Theme means you can develop great looking, professional quality sites more easily, more quickly and with less effort. And really importantly, all this lets you concentrate on adding great content! Because that’s the real purpose of a site – your good content is what you want people to find and is what they want to see!! Unlike many WordPress Themes (and other web design systems) that leave you struggling to implement your ideas and thoughts for a site, Catalyst Theme makes almost anything possible in a simple, easy, fast, effective way. You can specify what appears where on a page using custom widgets and hooks. Making design choices and changes is straightforward using intuitive selection boxes. Catalyst Theme has a full set of built in SEO options for rock solid SEO that search engines love. Talking of SEO – Catalyst does nice SEO friendly things like loading the page content first (before the sidebars etc). It also has In-Post / In-Page & Homepage Title, Description, Keyword & Meta control along with nice clean code that Search Engines love. Catalyst provides all the SEO refinement necessary for a serious, professional website that will naturally rise in the rankings. I liked the Catalyst Theme so much, I wrote the Catalyst Theme Cheat Sheet to go with it. For more details of the Catalyst Theme Cheat Sheet click here, or you can get it as a free bonus when you buy Catalyst Theme here. The Catalyst Theme Cheat Sheet is over 200 pages of great content designed to help you maximize the results you can obtain from using Catalyst Theme. It also provides an overview of the main functionality of the theme, including where to find and adjust various settings to get the most from it for your sites. Most importantly though, the Cheat Sheet covers how to develop an effective site using Catalyst; one that is optimized for SEO, that gets visitor traffic and that helps fulfill your expectations of, and intention behind, the site, be it revenue generation, lead generation, or spreading information to a wider audience. Remember that when you buy Catalyst Theme here you will get the Cheat Sheet free of charge.